Hello from Costa Maya/Mahahual. 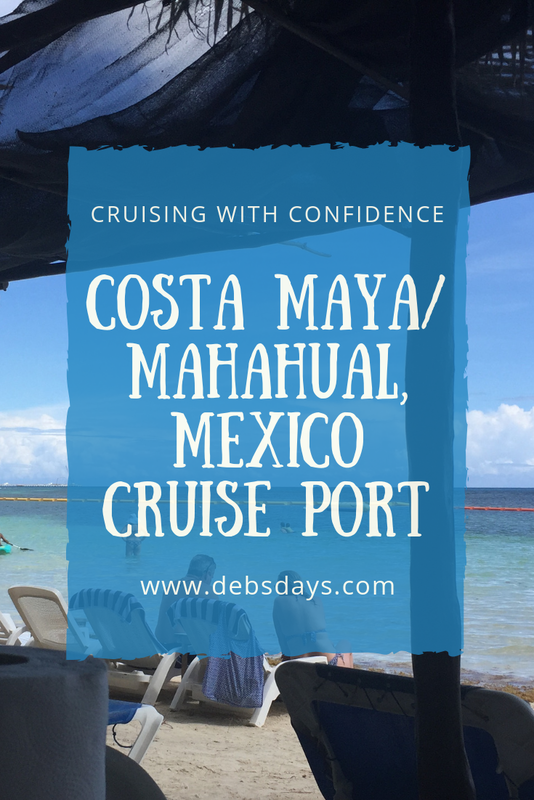 Costa Maya, the cruise port, has exploded in the past few years. We were here several years ago when the infrastructure in the port area was just being put into place. Compared to then it’s almost unrecognizable. For those wanting to shop or sun or eat or drink, there are now plenty of places right within the secure areas of port. But we never stop there. We instead go outside the port where we have two favorites we always choose from: Almaplena or Tropicante. Almaplena is quite a bit farther from the port. It’s an all-inclusive resort on a remote beach. Lunch is served on a patio and drinks are served on the beach (or patio). They limit the number of cruise passengers that can buy day passes so every one of our visits has been pretty quiet. Just the way we like it. If you’re looking for quiet relaxation with no watersports or kids running around or loud music, Almaplena is your place. But today we went to our other favorite spot, Tropicante. Tropicante is a pay as you go restaurant/bar and is located within the town of Mahahual, just a short ride from the cruise port. You can either take the trolley or taxi to make your way there. Last time we took the very bumpy, rattle-your-teeth trolley. We had planned on going with the taxi this time, but since you have to walk even farther to get to the taxis than the trolley, we went the closest route and again went with the $4 per person trolley. But the walk is far. If you’ve been to Costa Maya before you know the pier is long. They used to have a free pier trolley to get you from your ship to the end of the pier, but the last few times we’ve been here it hasn’t been running. Again today, no pier trolley. Now they are even adding more length to the pier. We had a Royal Caribbean ship in port with us today. They had a crew drill where they were using their water cannons. 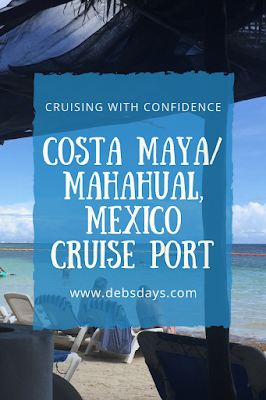 Costa Maya is definitely a port that is challenging for someone with mobility issues. Just to get from the ship to the place to buy tickets to the town trolley my app logged one solid mile. And that was with taking a short cut. You used to be able to exit between a couple stores but they have now closed that exit off. But…if you walk to Pan Dulce (across from the flamingos) you can cut through their store and shave some steps off your walk. Even with that store cut-through, it is still a mile. And to the taxis? Even farther. With the boom of the cruise port, there has also been a boom in the number of hawkers and scammers once you get into the town of Mahahual. You will find them everywhere, trying to direct you to their establishment. Don’t follow them and don’t listen to them. Heck, don’t even make eye contact with them. This is a port where once you leave the secure area you have to know where you want to go. While we haven’t found it unsafe in town, we do know others who have felt taken advantage of by them. So we always tell the trolley driver more than once we are going to Tropicante. So far, we’ve had good luck. An American runs Tropicante and so far we’ve had good luck there as well. (Do contact him ahead of time - he'll reserve you a table or loungers.) The servers are friendly and take great care of you. The drinks are strong and the food is good. Rum punch? Yeah, I had more than one. So nice to get a straw again! So we’re worried about straws but not this pollution put out by ships? And the view? Just plain nice. 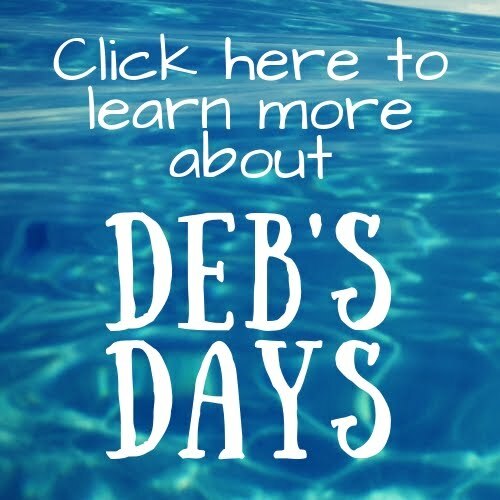 I had an amazing day just floating in the calm, easy-to-access water. It was a doozy. Power went out. Wind came up. Rain came down. Torrential, unrelenting rain. Those of us on the beach took cover inside the dark Tropicante bar to wait out the rain. The rain that never ended. Flooded the walkways and flooded the streets. That's our walkway out. Yikes. When we were ready to leave a guy from Tropicante grabbed a huge beach umbrella to try and keep us dry on our way to the taxi. But that umbrella wasn’t enough to keep us from being soaked by the sideways rain. Didn't help with the ankle-deep water, either. Once we arrived at port the rain got even harder. I couldn’t even imagine how that was even possible. More flooding. More ankle-deep water. And that hugely long pier to walk to get back to the ship. How bad and relentless was the rain? For the first time ever, there was no security at the end of the pier. No one checking cruise cards at all. We had to wring every item of our clothing out once we returned to the ship. I mean every single item. I could have peed my pants without anyone ever noticing. Once onboard crew members were handing out pool towels. Warm, just out of the dryer pool towels. It was like getting a warm blanket in the hospital. It felt so good. We’re now tucked away in our cabin with the privacy sign out trying to get ourselves warm and dry. I think we'll be calling room service for dinner. Boy, it was a great day.